Cephalopods (octopus, squid, nautilis, and cuttlefish) are amazing for several reasons. The Nautilis is the closest living representation of what an ammonite would have looked like. 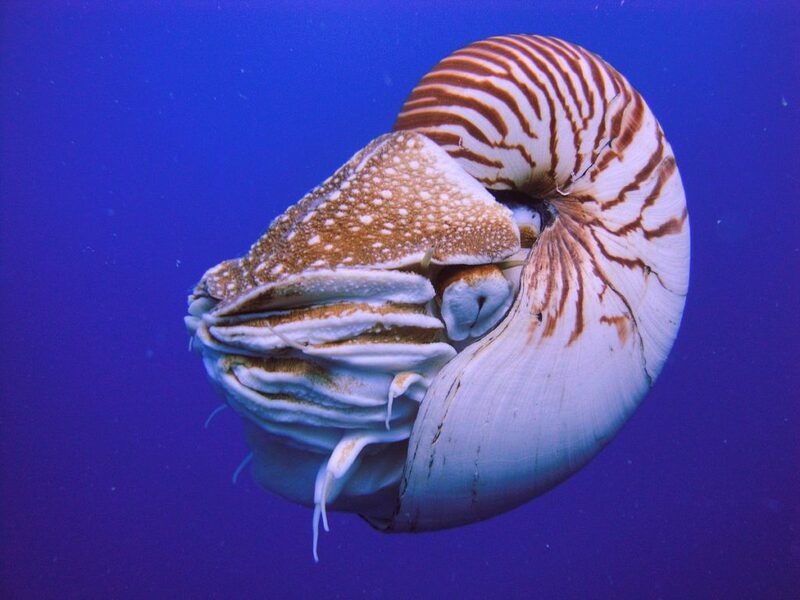 The Nautilis in all it’s cephalopod glory. From Wikipedia. Octopi (or octopuses or octopodes) are really smart, and can change their skin color and *texture*. One species of squid can grow to be 10-13 meters long (33-43 feet)! And cuttlefish are super cute. Cuttlefish on the left, Bobtail Squid (closely related to cuttlefish) on the right. Cephalopods are mollusks; mollusks also include snails, slugs, and bivalves. Cephalopods are mostly soft tissue, with the exception of the cuttlebone in cuttlefish, which is a remnant of a shell. As we know, soft tissue is harder to fossilize, so we don’t find many cephalopods in the fossil record if they don’t have big shells. Figure 1A from the paper showing a photo of the specimen with the new arm numbering. 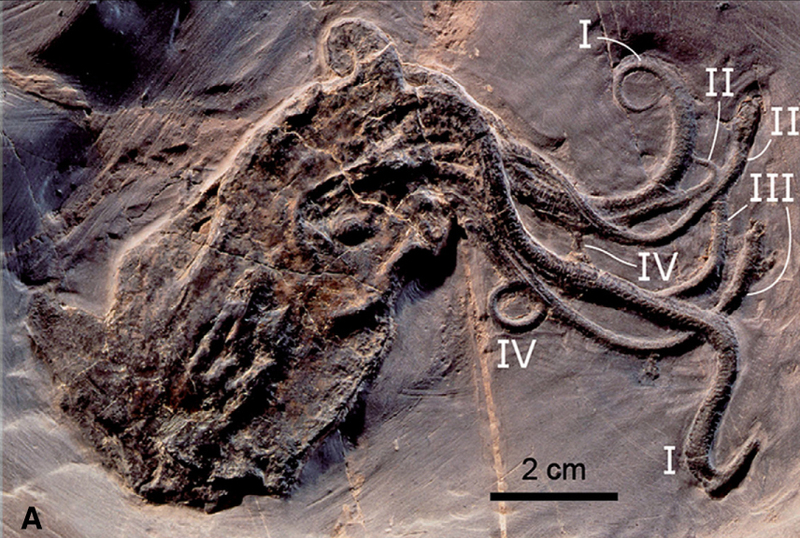 A [study] was published in December that re-described an octopus fossil from the Jurassic Period (201-145 million years ago) of France. Specifically, the fossil dates to 165 million years ago and is named Proteroctopus ribeti. 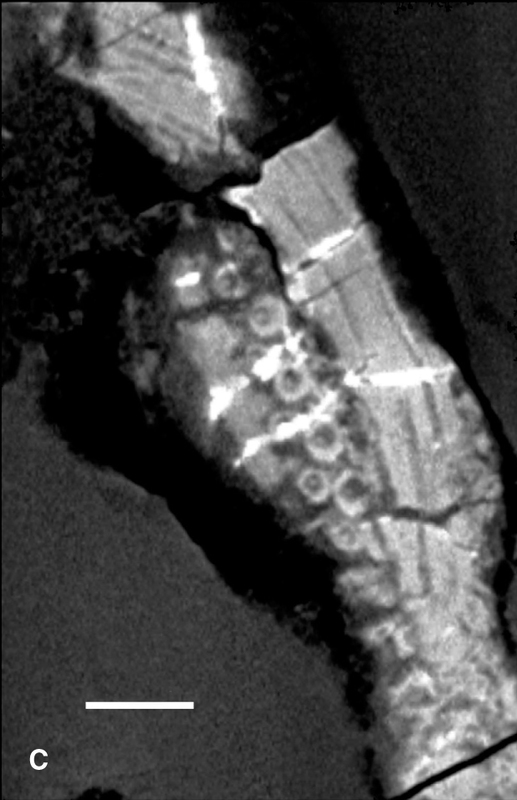 The authors used synchrotron computed tomography (CT) to image the fossil. For those who are interested, synchrotron CT uses higher energy radiation and a different beam geometry to get higher contrast images than regular CT scanning. Using these images, the authors found 2 well preserved eyes, were able to renumber the eight arms, and saw other details that were previously unknown. These included the absence of an ink sac, and the layout of the arm suckers. They found that the suckers are present in double-rows that are obliquely placed (so the suckers run down the arm in 2 rows, but they aren’t laid in pairs, rather they sit in a zig-zag down the arm). Figure 1c from the paper showing a CT image of the suckers on the arm. Using these details of the body, the authors added this species to an analysis of evolutionary relationships (called a phylogenetic analysis). This analysis placed Proteroctopus ribeti in the Vampyropoda clade. This means that Proteroctopus is more closely related to octopi than to squid, cuttlefish, or nautilis. The vampyropods also happen to include my favorite octopus: Vampyroteuthis infernalis (‘the vampire squid from hell’, which is actually an octopus, not a squid). Vampyroteuthis infernalis showing off its tentacles. When threatened, it wraps its head with its tentacles and uses the hooks for protection. From here. Now, Proteroctopus has suckers, not hooks, but the layout of the suckers shows that the diversity of suckers was high in the Jurassic. The authors point out that more fossils will need to be CT scanned to better understand the ancestral morphologies and the evolutionary relationships of this group.